Experience ultimate comfort and convenience at Residence Inn Seattle Downtown/Lake Union, one of the premier extended-stay hotels in the heart of the city. Step outside of our Seattle hotel suites and enjoy access to popular attractions including Pike Place Market, the Space Needle and Safeco Field. 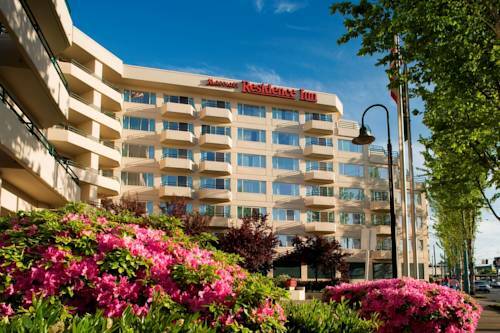 Our hotel is also near cruise terminals, Capitol Hill residential district, Amazon Campus, Boeing and the Fred Hutchinson Cancer Research Center. During your next stay, spread out in spacious suites with separate spaces to live, work, dine and dream. Enjoy 24/7 connectivity with complimentary wireless Internet access, and stay active with our on-site fitness center and indoor pool. Start your day with a complimentary hot breakfast, then unwind in the evening at True North Taproom, our on-site restaurant and bar. Your furry friends are also welcome to join you during your stay in one of our Seattle hotel suites! A refreshing retreat awaits. Start planning your trip and make reservations today. Get a taste of the Northwest at True North Taproom, our on-site restaurant, for a Seattle dining experience near Lake Union. Enjoy a wide selection of flatbread pizzas, local beer and Washington wines! Indulge your big foot fantasies by peeking at the world's largest collection of giant shoes, including one worn by Robert Wadlow, who had the biggest foot in history.